Genentech engineered a Fab interface that can facilitate single-cell bispecific expression. Bispecific antibodies represent a new generation of antibody-based therapeutics that boost the disease-fighting power of a monoclonal antibody by doubling its binding capabilities. A bispecific antibody can bind two epitopes or two different targets at the same time. There are two approved bispecific antibodies on the market currently and many dozens in clinical and preclinical development. As the field rapidly expands, a number of recent conferences have focused on new developments in bispecific antibody engineering and design. CD137, also known as 4-1BB, has long been known as a target of interest for cancer. It is a costimulatory immunoreceptor and a member of the TNF-receptor family. However, targeting immune receptors by monoclonal antibody therapies has proven difficult in the past, due to toxicity risk related to lack of selectivity for the tumor. This decreases the window of effectiveness of the drug. To address these challenges, Pieris Pharmaceuticals decided to put CD137 in the crosshairs of a bispecific costimulatory T-cell antibody, PRS-343. The development program behind PRS-343 was described by Marlon Hinner, Ph.D., director of immune-oncology at Pieris, when he was a presenter at the World Bispecific Summit. T cells are activated by two simultaneous signals, an antigen-specific signal from the T-cell receptor, and an antigen-nonspecific signal, known as the costimulatory signal, from molecules on the membrane of the antigen-presenting cell. If the costimulatory signal is not provided, the T cell will fail to respond. Exploitation of costimulation is a more complex challenge ideally suited to bispecific antibody technology. Pieris paired CD137 with HER2, a well-validated tumor target, using its Anticalin platform, to create a costimulatory bispecific T-cell targeting antibody. The company generated four different constructs, varying the attachment point of the Anticalin groups on the antibody. Geometry of attachment proved critically important, as the different constructs produced marked differences in T-cell activation. Pieris settled on a C-terminal heavy-chain fusion option as its choice for a lead product candidate. It was this candidate that came to be designated PRS-343. According to Dr. Hinner, the mode of action of PRS-343 is revealed by comparison to a monospecific CD137 agonist antibody corresponding to Bristol-Myers Squibb’s anti-4-1BB monoclonal antibody, which is also known as urelumab. PRS-343 had bifunctional activity with an increase in tumor-infiltrating lymphocytes, while the monospecific CD137 agonist’s response was insignificant. 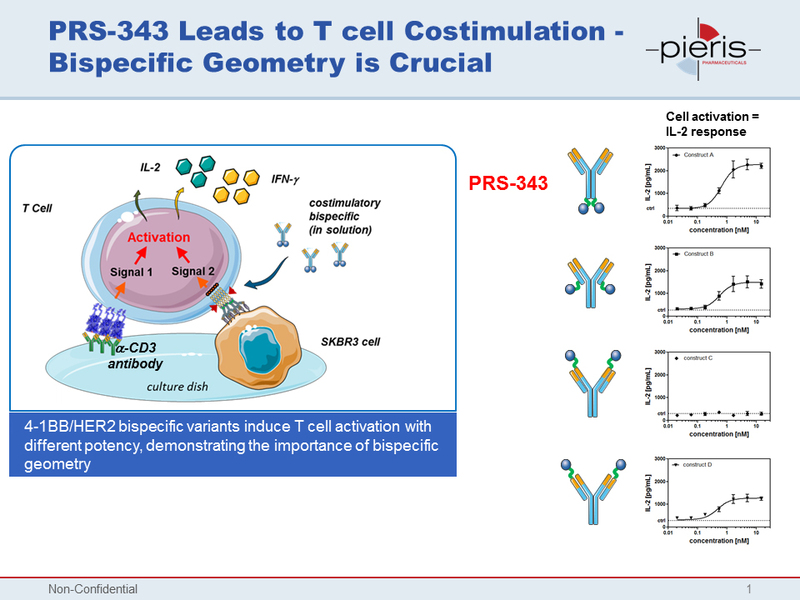 Unlike that comparator antibody, PRS-343 does not lead to expansion in peripheral blood, resolving an important potential safety concern for T-cell costimulating therapies. PRS-343, a bispecific costimulatory T-cell antibody developed by Pieris Pharmaceuticals, provides the costimulatory signal to activate a T cell. A C-terminal heavy-chain fusion configuration resulted in the highest level of T-cell activation compared to other configurations. 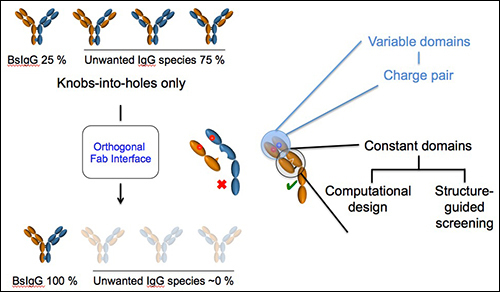 Bispecific IgG (BsIgG) antibodies are a popular format for bispecifics, but they can be challenging to produce due to their hetero-tetrameric structure. The expression of two different light and heavy chains can lead to as many as nine unwanted chain pairings in addition to the primary design. To avoid the pairing problems, developers of BsIgG antibodies sometimes produce them from two component antibodies in dual cell cultures. Dual cell cultures have the advantage of only two potential IgG chain mispairings. The Genentech approach combined an orthogonal fragment antigen binding (Fab) design with a knobs-in-holes mutation strategy. The result was minimal contamination from unwanted chain pairings. Dr. Spiess’s group used a structure-guided screening approach to design an antibody that minimizes mispairing. “What distinguishes our solution from the competitors is that we have fewer charge mutations that are necessary to achieve corrected pairing than what is described in the literature,” Dr. Spiess pointed out. Fewer mutations mean that the product is closer to a natural antibody and more desirable from a therapeutic perspective, and may also reduce the potential for immunogenicity. Medimmune, the global biologics research and development arm of AstraZeneca, has developed another bispecific approach, one that may be used to produce better HER2-targeted antibodies. Three HER2-specific antibody products are currently on the market. Their effectiveness has revolutionized breast cancer therapy, but there remains a high unmet need for products suitable for patients who are refractory or relapse after HER2-targeted therapy, and for those who are ineligible due to low levels of HER2 expression. Steve Coats, Ph.D., vice president of External Science Strategy at Medimmune, reported some preclinical results from the company’s development of a bispecific HER2 antibody-drug conjugate (ADC) for breast and gastric cancer at the World ADC Conference in Berlin. Current anti-HER2 drugs are not approved in tumors expressing low levels of HER2. It is thought that lack of effectiveness or relapse could be due to a heterogeneity of HER2 expression in tumors. Medimmune hypothesized that a bispecific antibody targeting two non-overlapping epitopes on HER2 may cross-link the receptors to form a meshwork structure, leading to lysosomal-mediated receptor degradation and release of the cytotoxic warhead. The company combined its bispecific antibody with a tubulysin toxin, creating a biparatopic ADC that induced cell death by disrupting microtubule formation. In cancer cell lines, the biparatopic ADC was 10 times more potent than T-DM1, and it was active in cancer cells intrinsically resistant to T-DM1. One of the most significant results of these studies, however, was that even in tumors with high heterogeneity of HER2 expression, treatment with biparatopic ADC resulted in sustained tumor regression. “HER2 doesn’t need to be the oncogenic driver. It’s just the address where you want the antibody-drug conjugate to go,” Dr. Coats explained. The bystander mechanism may be the free cytotoxin diffusing passively from HER2-positive cells into the microenvironment of the tumor, killing neighboring cells. Vascular endothelial growth factor (VEGF) and delta-like ligand 4 (DLL4) are two ligands known to be important in tumor angiogenesis, and both are thoroughly validated as antiangiogenesis targets. DLL4 has also shown activity in nonclinical models against tumorigenicity, which is thought to be an anticancer stem-cell effect. OncoMed is harnessing all of these therapeutic properties in a bispecific monoclonal antibody targeting both DLL4 and VEGF. By doubling down on antitumor activity, the company is hoping to develop a more potent, more effective product. Designed to have roughly equivalent affinity for both targets, the antibody, OMP-305B82, is expected to block signaling of both ligands at a single fixed dose. OncoMed touts OMP-305B82 as an “antibody-shaped antibody,” meaning that it has the structure of a native antibody without any additional groups added onto it. In a Phase IA dose escalation study, presented at the EORTC-NCI-AACR Molecular Targets and Cancer Therapeutics Symposium, OncoMed tested its anti-DLL4/anti-VEGF bispecific in patients with previously treated solid tumors. Robert Stagg, Pharm.D., OncoMed’s senior vice president of clinical research, said that 2 out of 46 patients had a partial response and that 16 had stable disease, resulting in a clinical benefit rate of 39%. Five out of eight evaluable ovarian cancer patients had a reduction in tumor volume, and four of those five had received bevacizumab previously. Macrogenics’s Dual-Affinity Re-Targeting (DART) antibody platform has produced several constructs that are now in clinical development in cancer indications, as are a large proportion of bispecific antibody therapeutics in development overall. However, DART molecules have applications beyond cancer. One of the company’s initial explorations outside of oncology is a program to develop DART molecules that will redirect T cells toward HIV reservoirs in patients treated with combination antiretroviral therapy (cART), a protocol that suppresses HIV replication to nearly undetectable levels in more than 90% of treatment-naive patients. However, cART is not sufficient to eliminate a reservoir of HIV that will begin replicating any time therapy is discontinued. Because lifetime treatment with cART is unlikely to lead to a full cure, there remains a need for new therapies that can eliminate HIV from its reservoirs. Macrogenics used its DART platform to devise a bispecific strategy targeting HIV Env protein and the human CD3 receptor. Env is an attractive target for in HIV therapeutics because this protein is selective and present on the surface of infected cells. Broadly neutralizing anti-Env IgG antibodies (bNabs) have been shown to reduce viral reservoirs in preclinical studies. Pairing an anti-Env function with anti-CD3 activity should elicit a cell-mediated killing mechanism that is distinct from the activity of the bNabs. At the World Bispecifics Conference, Macrogenics reported that its HIVxCD3 DARTs eliminated HIV-infected cells in an in vitro model of HIV reservoir cells. Ex vivo studies using cells from HIV-infected patients also showed elimination of HIV, as measured by a reduction in viral RNA.